The Honeywell RTH9580WF is a WIFI thermostat that gives the user a pleasant experience with some smart features sprinkled in. It has a business-like appearance and gets its job done in business-like fashion. Even though it’s a few years older than competing models, the RTH9580WF thermostat is still a popular choice. I think it’s a classic case of “if it ain’t broke, don’t fix it”. Continue reading or use the links below to skip to exactly what you’re looking for. Not everyone likes the trendy look of the Nest. You may prefer something a little more conventional. The RTH9580WF fits that description. If I am running a tech startup with a bunch of Apple geeks working for me, the Nest might be right at home on my office wall. 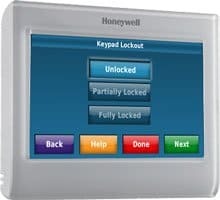 But, in most cases, I think I would opt for something like the Honeywell RTH9580WF with its more traditional look. For those unable or unwilling to use the companion app, the full set of features can be accessed from the touch-screen display. The display gives you a readout of the current date, time, indoor and outdoor temperatures, humidity and its current heating/cooling status. The screen brightness and color are fully adjustable. Change the background color to match your décor and adjust the brightness to suit your preference. For consumers with questionable eyesight, the background and shading available make for an easy to read display of information. Plus, the screen size is large enough (3.75 in x 2.25 in) that you won’t need a magnifying glass. Even though the screen is large, the whole unit does not look bulky or out of place on the wall. In fact, it only sticks out from the wall 0.8 in compared to 1.2 in for the Nest thermostat. Once you have purchased the unit, there are no hidden fees associated with the use of this thermostat. The companion app is also free so you don’t have to pay for anything else in order to enjoy the comfort of regulating your home’s temperature from anywhere in or out of your home. If you wish to save a good chunk of change on your heating and cooling bills throughout the year, then you can select the unit’s programmable mode. That’s the main reason for having a smart thermostat, right? The simple programmable thermostats of the last couple decades were often difficult to program. The small screens made it difficult to see and the lack of an intuitive interface meant step one of reprogramming the thermostat was often fumbling through messy drawers trying to find the manual. Say goodbye to the past because using the touchscreen of the RTH9580WF to program the thermostat is intuitive and quick. You also have the option of using the app to program your schedule. Setting up the schedule with the app is really nice. You have the option to wing it and figure out the scheduling by yourself (it’s actually very easy, dare I say pleasant even?) or you can answer a series of step by step questions and at the end, the app will set your schedule for you. Once your initial schedule is setup, you can easily go back and edit it at any time. The Honeywell WIFI thermostat will learn about your house and how long it takes to heat/cool. It will take into account the outside weather conditions and previous performance. It will turn on the heating/cooling before your scheduled time so that it reaches the set point right at the scheduled time. 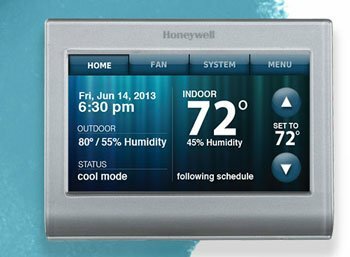 Schedule the thermostat for right when you get up and the Honeywell will take care of the rest. No more hiding under the covers in fear of the cold air! Unlike some other smart thermostats, this one does not lose its brain if the internet goes out or it has connectivity issues. Although you will lose the ability to control it via the app, it will continue to function as it was programmed. If consumers wish to purchase this unit for its ease of use, they are able to use the thermostat as a standalone unit. 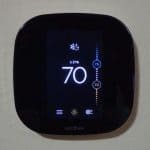 While many people think that the Wi-Fi capability is a bonus adding to the power packed features, some people who aren’t technologically savvy can still enjoy the thermostat by itself. To do so, they can simply use the touch screen interface without the need for the companion app. The thermostat requires a c-wire for installation and runs off wall power. This unit does not require any batteries and doesn’t have any replaceable backup batteries. If it loses power, all the settings are saved in the onboard memory. When the power comes back on, the thermostat will continue to function as it should without needing any action from you. Can It Automatically Switch From Heating To Cooling? Not all smart thermostats have this option, but the RTH9580WF has the ability to automatically switch from heating to cooling. 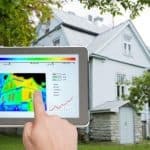 I don’t know of an environment where you would be switching between heating and cooling more than a couple times a year, but I’m sure someone somewhere has a need for it. Regardless, most people have to switch it at least twice a year so you might as well have a thermostat that does it automatically, right? 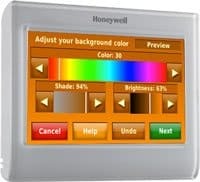 The Honeywell RTH9580WF updates and displays the outdoor temperature and humidity once per hour. 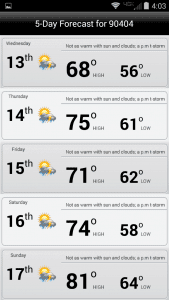 You can also easily view a 5-day forecast from the app. 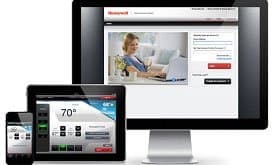 If you’re wondering where the outdoor temperature data is gathered, Honeywell gets it from Accuweather.com so it won’t work if the thermostat is not connected to the internet. The app is well-designed and responsive and it’s completely free. In fact, you can download it right now and test it out in demo mode. The app supports Apple or Android devices. Enable email alerts to inform you if the system has a failure or if the temperature inside your home surpasses your predefined range. Informs you of the temperature inside and outside of your home and allows you to adjust it from wherever you are. 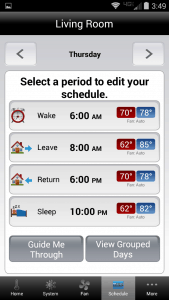 Allows you to set up multiple users and add multiple thermostats. Users can be restricted by PIN or specific user accounts can be set up. While you can protect your thermostat with a four digit pin that disables use by others, you can also offer limited access to third parties as needed. In your ‘My Total Connect Comfort’ account, you can add email addresses for additional users in the case of visiting relatives, house sitters or babysitters. This enables other people in your home to take advantage of the thermostat’s features via the touch screen interface or by using the companion app. For those not wanting to give access to children old enough to reach the unit, you can lock the touch screen. This also works to offer the homeowner a thirty-second window in order to clean the unit of unwanted fingerprints without compromising its settings. In addition, you can set a password for use with the unit so that everyone who knows how to use it can do so with ease. For those wishing to do the installation themselves, you can watch an eight-minute YouTube video that provides you with instructions on connecting the unit to Wi-Fi and your heating and cooling systems. The thermostat works with most HVAC setups. The most notable exception is high voltage heaters such as electric baseboard heaters. You will need a c-wire to install this thermostat. If you don’t have one, you will need to get one. 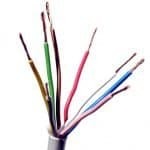 There are several commercially available “add-a-wire” solutions. However, it will require access to your HVAC control board and the ability to read a wiring diagram. If this seems like it is beyond your comfort level, then your best option would be to contact a professional installer. For me, one of the most important features a smart thermostat should have is the ability to predict when your home is empty. Then it should adjust the temperature accordingly using predefined settings for home and away. Some competing smart thermostats do this by using sensors in the home or by using the GPS feature on your mobile phone. This WIFI thermostat does not attempt to do that. So in this sense, it is more of a “connected” thermostat than an actual “smart” thermostat. With this thermostat, you rely on the schedule that you program. It doesn’t learn your schedule or sense when your house is empty and then adjust accordingly. However, if you do deviate from your normal routine, you can always use the app to override your existing schedule. One drawback to the Honeywell RTH9580WF Wi-Fi Thermostat is the inability to generate reports based on your energy usage for any specific length of time. Other thermostats in this price range offer the ability to crunch the numbers with regard to how much energy you’re using, but if you don’t mind, then you won’t miss the feature at all. Unlike its many competitors, this particular model is a bit older. It was released in 2013. Honeywell released their newer, Nest-like thermostat called the Lyric in 2014. However, the Lyric has been plagued by bad reviews and connection problems (hmmm, I wonder if the connection problems had anything to do with the bad reviews). Many customers are continuing to choose the proven RTH9580WF over the newer, somewhat troubled Lyric. This thermostat is really easy to set up and use. Both the app and the touch-screen interface work smoothly. You don’t need any special home automation equipment to make it work. All you need is a WIFI router and a mobile phone. If you can use your mobile phone, you can use this thermostat. The app is set up really nice for anyone that has multiple properties and wants to control their thermostats with one app. 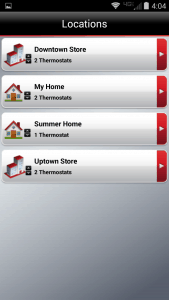 It allows you to set up multiple locations and each location can have multiple thermostats. Maybe you’re a homeowner with a vacation property or two. Maybe you’re a landlord with a few rental properties. Or maybe you’re a business owner with all of the above. The RTH9580 can help you manage your properties and save money. Many companies don’t see any activity from personnel between the hours of 6:00 PM and 7:00 AM. The thermostat can be programmed to a lower heating or higher cooling temperature depending on the season in order to save money. Of course, if it’s 2016 and you are missing out on big savings because you’re not doing something as simple as using a programmable thermostat at the office, then, ITS TIME TO GET ONE. If you need a thermostat that is easily programmable on a day-to-day basis or just simple to control through an app, then look no further. This thermostat is ideal for homeowners and business owners who wish to have a versatile app-controlled interface but don’t need the extra “smart” features offered by its more expensive competitors. If you require data reports to see which times and dates you are consuming the most energy, then this is not the unit for you. If you are looking for a thermostat that senses when your home is empty, it’s not for you either. Aside from those two objections, this thermostat is great for those who do not possess any technical knowledge and don’t wish to spend time setting up a complicated home automation system. You can easily operate this thermostat from anywhere in your home or the world using any Wi-Fi enabled phone, computer or tablet. For those considering the many options when it comes to heating and cooling your home, the Honeywell RTH9580WF thermostat definitely stands the test of time. While this unit is three years old in 2016, it still packs a wide variety of useful features for homeowners looking for easy to use models that aren’t expensive. 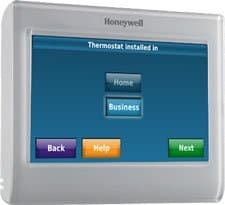 Honeywell is not new to the thermostat game and they have proved that by creating such a great model.